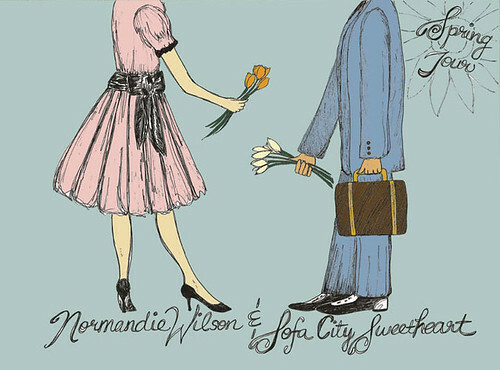 Normandie and I are going on tour again, this time to the glorious MIDWEST! Check out the dates below!!! I really can’t wait to see the whole middle chunk of our beautiful country (I’ve never even been to most of these states before.) PLEASE tell your friends in the following areas to come by and say hello, this one’s gonna be fun. We’ve done a lot of prep work and made sure to have new songs, new live set-ups, and new merchandise ready to go. Also, if you’re going to the festival, make sure to catch us at SXSW! More news soon, keep an eye on Twitter for the latest. Midwest Spring Tour w/Normandie Wilson! w/Fever Fever, Natalie Prass, more. 1:30pm, all ages, FREE! w/Dubb Nubb. 8:00pm, all ages, FREE! w/Darby Tweed, California Condors, more. 9:00pm, 21+, $5.